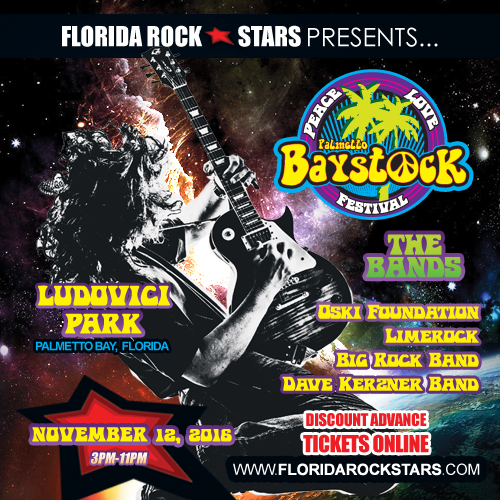 Florida Rock Stars presents Palmetto Baystock 2016 Saturday, November 12, at Ludovici Park in Palmetto Bay, Florida. The event continues a fine tradition of bringing the best local classic rock bands in all of South Florida to Miami. This year’s show features The Dave Kerzner Band, Limerock, Big Rock Band, Oski Foundation and more! Enjoy the music! The festival also showcases some of the best food around, including amazing stone crabs, killer barbecue and loads of other tasty foods served up by local gourmet restaurants. A host of merchandise vendors and the cash bar, photo booth and VIP Rock Lounge round out the festival experience. The event includes a special raffle and other initiatives to help raise money for our local charity partner, Parker-Haar Charities. Finally, the VIP Backstage Pass includes front row VIP table seating and access to the air conditioned club house and bathrooms above the stage with live video remote of the event. VIP guests have access to a private liquor bar, finger food and balcony view overlooking the show. Mingle with the bands, get autographs and photo ops and live like a rock star! Gates open at 2:30 pm and the show runs from 3:00 pm to 11:00 pm – no coolers or animals permitted, rain or shine. Lounge chairs and blankets are welcome. Admission includes park entrance only and excludes food and drink. Florida Rock Stars is a marketing and promotion company focused on connecting local business with local fans through good times and good music. We accomplish this by providing unique marketing opportunities via our Florida Rock Stars-branded food and music festivals. Visit www.floridarockstars.com or Florida Rock Stars on Facebook for more information.